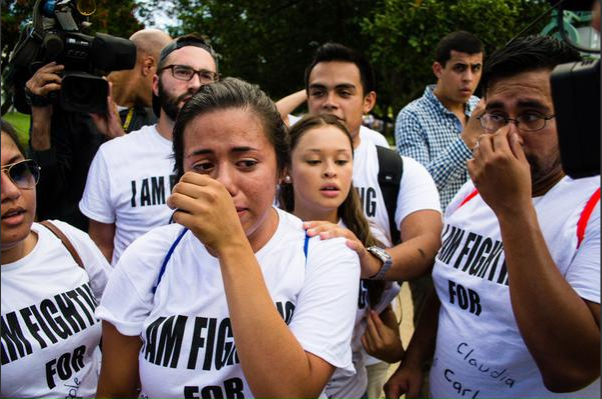 Immigrant activists who crashed Donald Trump and Ted Cruz’s #StopIranDeal rally on Wednesday in D.C. say that they were spit on and otherwise assaulted by crowdmembers before being forcibly removed by police. Video of the event shared by immigration advocates show protesters yelling “hey hey, ho ho, Donald Trump has got to go” and opposing rally attendees yell “go home.” One immigration activist was apparently violently yanked by her ponytail, reducing the woman to tears. A series of photos by a fellow activist Jassiel Perez of United We Dream seem to show an unidentified man going up behind Erica Fuentes, grabbing her by the hair, and yanking it violently. The man wears a T-Shirt that says “Stop Iran Now.” Latin Times was not able to verify the sequence of events leading up to the incident. United We Dream and other Dreamer groups have been known to carry out agressive and disruptive but non-violent protests. The man in the Stop-Iran-Now T-shirt holds a sign whose message appears to be obscured by pictures of military decorations that were added later. The violent act is the latest uncouth outburst by attendants of Trump’s events to be caught on camera. “This is not about you. Get out of my country,” an unidentified Trump supporter yelled at Mexican-American journalist Jorge Ramos in Iowa in August. Ramos is a U.S. citizen. Fuentes told the Laitn Times that she is a U.S.-born citizen with Salvadorian heiritage, and that she attended the protest to stand in solidarity with the immigrant community. Like other members of the protest group, she wore a shirt with names of immigrants. Video of the #StopIranNow event shared by Mario Carillo, also of United We Dream, shows another one of the tense interactions between #StopIranNow supporters and immigration activists. The Iran deal itself is likely to go through, after opposition lawmakers reportedly engineered a deal that would allow it to pass Congress without requiring them to vote “yes.” Ted Cruz, who spoke at Wednesday’s rally voted for the deal in May, saying that while it was “ bad ” it would allow for debate. Critics say that the deal, which includes the lifting of U.S. sanctions on Iran, will allow the country to obtain a nuclear weapon. Update: this article has been updated after identifying the woman who appears in the photo.